Aston Martin is expected to name its first SUV Varekai following the application of a new trademark. Since it was announced at the 2015 Geneva motor show, the model, which is due on roads in 2019, has been referred to as the DBX, the name of the concept that previewed it. But the Varekai name looks set to adorn the final version because it sticks to the brand's naming convention by starting with a V, like the Vantage, Vanquish and Valkyrie. Aston declined to comment when contacted by Autocar. The production model is currently under development — its design was signed off late last summer — with intentions of drastically boosting the 105-year-old firm's sales. Aston is going from strength to strength, having posted record profits last year totalling £87 million — £250m more than the £163m loss the brand recorded in 2016. When the DBX production model arrives, it will rival the Bentley Bentayga, Lamborghini Urus, Maserati Levante and top-end Range Rovers and Porsche Cayennes in the luxury 4x4 segment. However, CEO Andy Palmer has previously stated that the DBX will stand apart “because it has not sacrificed any beauty to achieve its practicality or performance”. The SUV project was envisioned by Palmer before he took up his role at Aston in 2014 and it was officially kick-started on his fourth day in the job. “When you are talking about running a company like Aston, you talk through your ideas with the owners before you are hired,” said Palmer. “My message was simple: if Aston wants to survive, it must do an SUV. “On my fourth day [as CEO], I got to spend some time with Marek [Reichman, head of design] and I told him I wanted DBX. That was in October and I told him I wanted a concept car ready to show in Geneva by the following March. The DBX concept of Geneva 2015 was a two-door, four-seater powered by electric motors mounted inboard of the wheels and powered by lithium sulphur cells. The car featured other high-tech concept flourishes, such as an Formula 1-style kinetic energy recovery system (KERS) to emphasise that it would be at the cutting edge of powertrain technology when it was launched. However, Reichman and his team also made a point of highlighting more practical elements, such as interior and load space. Reichman has suggested the roofline will have to be much higher than that of the concept in order to give the production car an extra layer of practicality. The DBX will be built on a new bonded and riveted aluminium architecture that is closely related in principle to that used by the DB11. There had been speculation that Aston would lean on part-owner Mercedes-Benz for its chassis technology, but Palmer said Aston preferred to make use of its own expertise, albeit turning to Mercedes for some sub-systems and V8 power, as it will do with all of its next-generation vehicles. The DBX will also be the first Aston to be sold with four-wheel drive, although it’s not clear if every model will have that function. Power in the range-topper will come from Aston’s 5.2-litre V12, which will be retuned from the 600bhp and 516lb ft unit found in the DB11. There will also be an AMG-sourced 4.0-litre twin-turbo V8 that makes 503bhp and 498lb ft and — in time — an all-electric powertrain that will be developed as proprietary technology by Aston with input from Williams Advanced Engineering. Palmer has ruled out diesel versions of the DBX. However, Palmer confirmed that a hybrid version will be developed, but it will not feature plug-in hybrid technology because research suggests luxury car buyers do not consider the experience to be premium enough. This revelation raises the possibility of Aston using the high-performance powertrain from the Mercedes-AMG GT Concept that was revealed at the Geneva motor show last year. Its hybrid unit combines AMG’s twin-turbo 4.0-litre V8 with an electric motor to deliver a combined 800bhp. In the GT Concept, that equates to a 0-62mph time of less than three seconds, although the DBX will be heavier. The battery is charged as the car is being driven through brake energy recuperation as well as with the aid of the petrol engine. However, Palmer also highlighted the lessons the company had learned while developing the hybrid KERS-style system with Red Bull Advanced Technologies for Aston's Valkyrie hypercar, suggesting the firm could use a modified version of that instead of turning to Mercedes. In terms of ride and handling goals, Palmer highlighted the characteristics of the Porsche Macan. “It is probably dynamically the best car in the SUV category,” he said. The interior of the DBX is set to take a new approach, with the design team having to focus more than ever on practicality. “There are certain issues you can’t compromise on that perhaps we haven’t given such credence to in the past — ingress and egress, for starters, and whether it is a car you sit on or sit in,” said Palmer. “DBX is a revolution for Aston in so many ways and that has meant that we have had to adapt our way of thinking in places. Aston has created focus groups of existing customers to provide input, including the much-vaunted female focus group, which was instigated on Palmer’s suggestion as soon as the concept car was revealed after it emerged that just 3500 of the firm’s lifetime sales of 70,000 cars were to women. “Some very special customers have seen the car to help guide our thoughts and provide feedback,” said Palmer. “They are our jury and our anchor points to what we want the car to achieve. Preparation for DBX production at Aston’s new facility at St Athan in Wales is well under way. As well as building all large Astons, the site has been earmarked to become the firm’s centre of excellence for electrification and cyber security. Customer and staff reception areas have been built and work is in full swing to repurpose three hangars into the manufacturing plant. At launch, 750 new employees are expected to work at the facility. St Athan’s role in Aston’s growth will be pivotal as the firm continues to grow its line-up following the launch of the new Vantage last year. 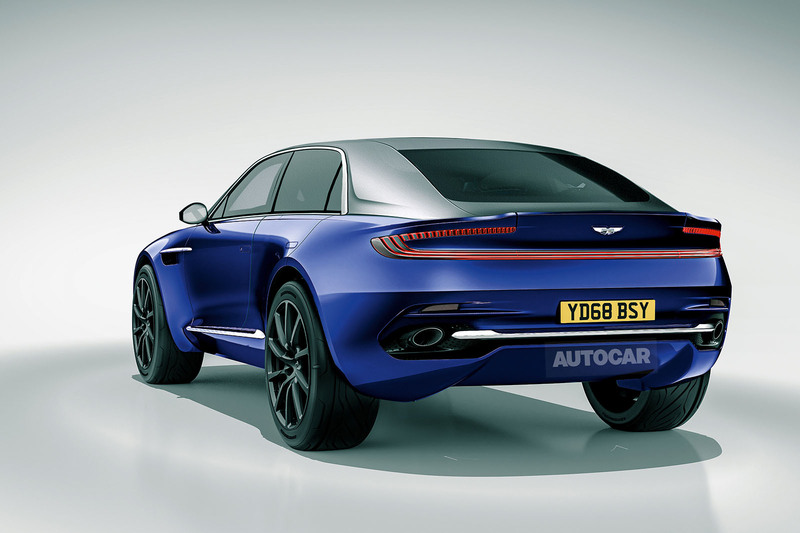 A significantly more potent new Vanquish is due this year, while the DBX is expected in 2019, followed by a mid-engined supercar in 2020, the Lagonda saloon in 2021 and a Lagonda SUV in 2022. Aston's fortunes have transformed since the start of 2017, when the firm posted a first-quarter profit (£5.9m) for the first time in a decade, boosted by sales of the DB11. Aston had posted an annual losses since 2011 before that. The brand recently relaunched the Lagonda brand as a standalone luxury electric division. ..it'll be much better-looking than the Bentayga. No great achievement in itself,I know, but that alone should ensure that production will struggle to meet demand. Another pretend off-roader. Saw a DB4 GT at the weekend. What a sad end for this once charismatic marque. Without this new vehicle (which will roar out of the showrooms and be hugely profitable, by the way) it would be the end for the marque. I feel a sense of relief that there will be no diesel. However I would be nervous concluding that V12 and V8 engined 4x4s were the answer to profitability. Large petrol engined 4x4s exist at Bentley and Porsche but I'd conclude the bulk of Cayenne sales are of diesel engined versions. The DBX will be a nice if not splendid or super machine. But I view it as something of a follie. Sustained profitability should come from a sub £100,000 sports car, a junior Aston Martin. What? Not 100% hybrid as per earlier claim? More nonsense / BS from Aston Martin - they certainly know how to play the media for free exposure! Is the Mondeo front end transferable? Exactly, you see a mondeo in your mirror yet an aston passes you ? Just to let you know, I've given you the benefit of the doubt and surmised that you misspelt grammar deliberately.